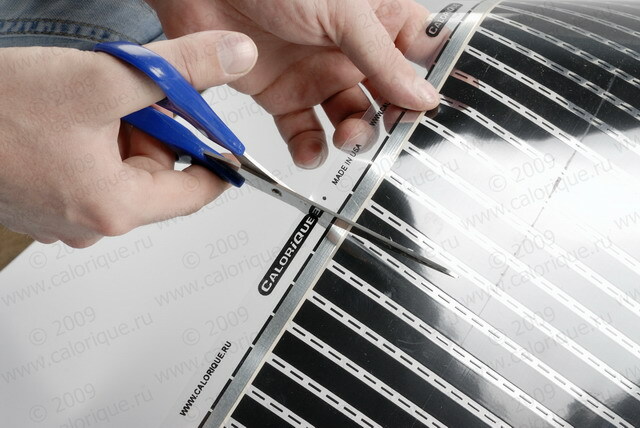 Cut the heating film along one of the dotted lines with a pair of scissors. You cannot cut the film in different way. Attach the connector terminals to the prepared foil strips. Attach the clamps with a pair of pliers, a hammer or a crimping tool. Check the contact rigidity. Insulate the rails from the other side of the strip with a pad of insulation tape from the Calorique Set. Prepare the electrical cables with a cross-section of at least 1.0 mm2 from the Calorique ® Set. Crimp the stripped wire end to the connector terminals with a pair of pliers. Isolate the electrical connection with the self-welding tape from the Calorique ® Set. 2.Insert in the space between the joists insulation material to the desired thickness. If this is a renovation and the insulation layer is already available, you can skip this step. 3.Insert the insulating foam sheet with metal coating. Attach the foam sheet with the coating up to the joists, so that 5-7 cm distance to the final covering remains. 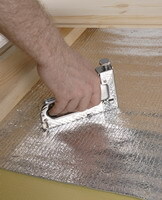 Over the coated insulation material, fasten the heating film Calorique ® parallel to the joist. The heating film has to be fixed so, that in the bottom there is an air space between the heating foil and the foam sheet. Attach the heating foil with staples or nails on to the floor, so that approximately 150 mm for electrical connections to the wall remain free. The distance between the staples or nails should be more than 300 mm on each side of the strips. If the spacing between the joists is more than the width of the heating film, then attach wooden slats to the joists and attach the heating film to those slats. 4.Connect the heater strips parallel each other to the thermostat. 5.Attach the temperature sensor with a strip of adhesive tape ca. 3-5 cm from the heating strip. 6.Test the system. Check the electrical connections and the insulation. Visually check the system, the insulation, the contact attachment. Your visual check look for possible traces of damage to the foil strips, which may happen during installation. 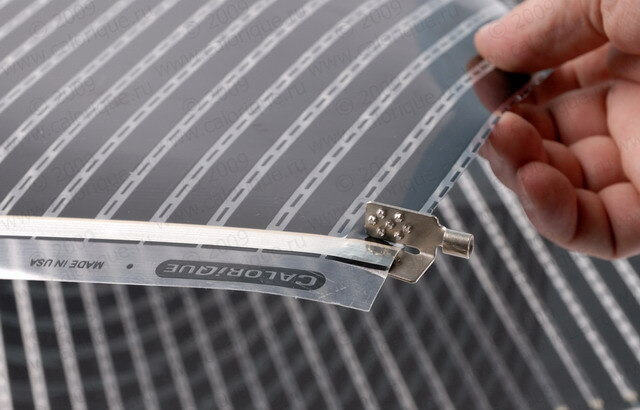 If a portion of the strip is damaged, it is recommended to replace the entire strip. Upper limit = resistance 63360/installed Watt. Lower resistance limit = 54720 /installed Watt. Check the measured value after the execution below. Ok, everything is in order, no further action necessary. Open circuit. Check all connections and repair everything as required. Check all cables for damage. Foil strips with damaged power rails must be completely replaced. After any repairs, electrical testing should be performed again. All this work should be carried out most carefully to avoid possible damage to heating elements. 7. Lay the top layer of the wood flooring. 8. Enjoy the warm floor.